FiberCell’s CDM-HD Serum Replacement formulation provides a chemically defined serum substitute designed to improve high density bioreactor productivity, product purity and final yield as well as sparing the hidden costs associated with serum use. Once cells reach high density they can be switched, without adaptation, from DMEM/10%FBS to DMEM/10%CDM-HD. Designed specifically for the FiberCell hollow fibre bioreactor, CDM-HD also works well in high density 2-compartment flasks and rollers. Download the FiberCell CDM-HD brochure. Because of undefined composition, risk of contaminations, cost factors and also animal welfare considerations, the switch to serum free alternatives is promoted by regulatory authorities, industry and academics in general. Serum is an ill-defined mixture and often contains adventitious agents and by-products like bacterial endotoxins and other immunogenic contaminants. Furthermore batch qualities vary and the costs can be high. Sera are a major source of viral contaminants which often do not produce cytopathic effects or morphological changes but once present are almost impossible to remove from cultures. Some important advantages in the use of totally defined media are the avoidance of risks of contamination and immunogenic stimuli and lot to lot consistency Possible contaminants include viruses, prions and mycoplasma which highly impair pharmacologic use of culture derived products. By contrast, a totally defined, animal component free, protein free medium will not contain any proteins nor any materials derived from animals. Purification of the desired secreted product is facilitated and regulatory compliance is made much simpler. 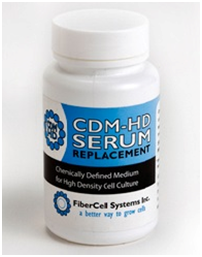 CDM-HD Serum Replacement is a protein and surfactant-free substitute designed specifically for high density cell culture in the FiberCell® hollow fibre bioreactor. Using CDM-HD means simplified purification protocols and increased net yield. CDM-HD Serum Replacement is provided as a pack of dry powder to be made up to 1 litre and sterile-filtered to be used just like serum – at a concentration of 10% in DMEM/High, for example. DMEM is the preferred basal media for highest cell density. One pack containing 33.36g enables 10 litres of serum-free media to be produced at low cost. CDM-HD Serum Replacement offers a serum substitute fully optimized to exploit the unique high density conditions in a hollow fibre bioreactor or in high density culture flasks. (Not for standard flasks or rollers). An adaptation period is not needed, you can replace serum with DMEM/10%CDM-HD once cells are growing at high density. CDM-HD contains no detergents or other cell membrane stabilizing agents that sometimes interfere with assays or precipitations [see composition table].